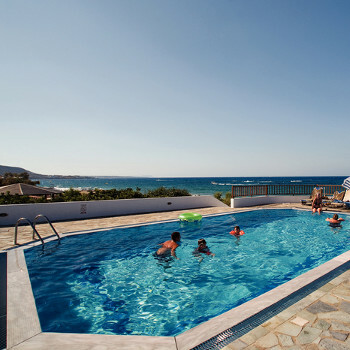 A great base for exploring the island, the well-kept Ekati Apartments are set amidst beautiful gardens with great views overlooking the sea. The apartments have their own pool which you can take a refreshing dip in or laze around on the mosaic-like terrace. We have been to Stalis four times; these apartments are the best we have stated at. The pool and the area around it are very clean and overlook the sea. If going there I would recommend booking one bedroom apartments as the studios are a bit dull. Our apartment was large with two large balconies, we will be going back. Location was great but unfortunately (even though we booked 14 months in advance)we were given the worst apartment there, 302. The only window was 6 inches by 24 inches, the air conditioning was right next to the door and may have been a fire hazard. Other residents nick named the room the dungeon. Direct Travel have not responded to any of my e-mails or letters of complaint though we followed the procedure they specified. Stayed at the Ekati apartments in Sept 2006. I thought I must warn people our safe in the apartment was robbed along with at least 4 others, the thieves had keys, no sign of break-in. They only took some cash did not take everything to make you doubt you had been robbed at all. Also so they could do it again to others. This I am certain this was the case as we later found out this had happened before in Aug 2006. Hotel owner although apologetic did virtually nothing to help us didn't want to call police till we all demanded he did. Also found out he said he would change all the locks after first time but did nothing. Until this was having a good holiday but this completely ruined the rest. Beware the safes and rooms can be entered any time. Right on the beach with a clean swimming pool! Only downside was no pool bar but you could take your own food and drink round the pool. Ground floor rooms were a bit dark but family rooms looked nice and big. Crickets were a nuisance but cant do much about that. No entertainment obviously but excellent location at the quieter end of Stalis with many bars and resturants nearby. Visit the Fontana resturant for the best pizzas!